If you would like to upload your own costume to this site, simply fill out the submission form. Please provide detailed directions for creating your costumes. I’m sure our visitors would appreciate you for providing them with such great information. 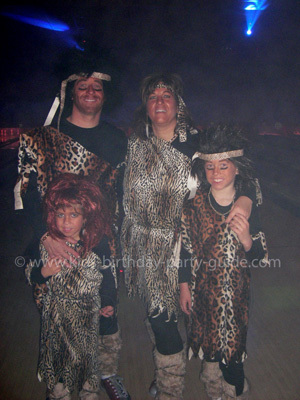 The Cavemen Family was a fun Halloween theme to do with my family. Each person was willing to participate, which made it easy for all of us to dress up for Halloween. I simply went to the fabric store to get some ideas and when I saw the animal prints, the idea came to my mind. I did some research on the internet to find out what cavemen wore in those days, and then I gathered up materials to put the outfits together. I bought material for the dresses that were warm, had a bit of weight to it, and looked like a real animal. I chose the same print for my husband and son, and a different one for me and my daughter. The amount of material used depended on each person’s height. I bought a 60″ width wide material, so that was plenty for the front and back. I measured from the neck to just below the knee for the length of the dress for each person. I cut the material on an angle from the neck area to just below the armpit only on one side for each person’s dress. I cut the material on an angle for one arm to create a draping effect. I then measured each person’s waist and sewed up the sides accordingly. I made a few adjustments with each person’s caveman costume as they tried it on to make sure the angle was not too low so that it would not fall off the neck. I cut the bottom of each dress with a rotary cutter to create a jagged and tattered look. I used leather strapping to tie around our waists. I created fur looking legs with fun fur and held it together with leather strapping in a zig-zag pattern. All of these materials I bought at the fabric store. I took the measurement of each person’s head, waist, height from neck to just below the knee, size of leg (height and width) and used myself to measure how much of the leather strapping would be needed for each leg. 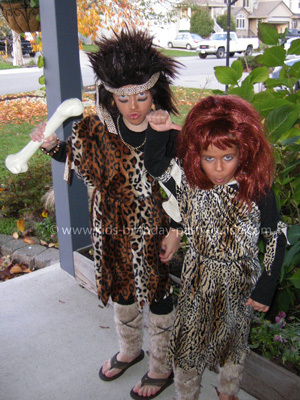 I used animal print ribbon to tie around our heads as the cavemen wore headbands. I used leftover material from our dress and tied it on our arms to create armbands. I bought the wigs at Value Village (there were no cavemen wigs, so I bought wigs that had wild hair). For the cavewoman costume, I teased the hair to make it big and messy. I found some necklaces with real teeth and bones on it to accessorize the outfits. I put a bronzer makeup on our faces to look rough and dirty and used black paint around the eyes as the cavemen people were hunters. To keep warm (Halloween night is usually cold in British Columbia) and to compliment the outfits, I put black shirts and tights underneath. I even found a bone at Value Village for my son to carry with him. This was so much fun and easy to put together. It took me about 1 night to sew 4 caveman costumes together and a few hours at the fabric store accumulating all the material needed to create the Cavemen Family. These costumes were inspired by the Children’s Garden near our house. The garden is a public park with beautiful gardens with unique play areas for kids to play in. One play area is a cave that my kids have always loved. Of course I had to take them there before Halloween for the great photo op! The only thing I’ve ever sewn is pillows, so you do not need to be a skilled seamstress to make this costume. Fold animal print fabric and cut out a crescent shape at the fold, for the head. Put over your child’s head inside out. While on child, carefully safety pin loosely down the sides around your child’s body. Cut off excess fabric a few inches away from safety pins. Also carefully cut excess fabric around arms. If one shoulder costume is desired, cut under arm and across chest, making sure to keep her modestly covered. (You can always trim it more later) Now make sure you can lift this over your child’s head. If you cannot, then move the safety pins out a little. Take costume off of your child and stitch up the sides by the safety pins leaving space for the armholes. Your stitches do not have to be neat or pretty…mine aren’t! Before moving on, make sure you can get it comfortably over your child’s head. Step Three – Now’s the fun part!â€¦Embellishing! Cut a large square of brown felt the width of the body and stitch to the neckline. Trim jagged edges as desired. You only have to stitch at the top. Now cut some strips of the fur 1-3 inches thick, your preference. Give those a quick stitch onto the costume. Again do not worry about your stitches, I discovered fur is very forgiving when it comes to ugly stitches. For a boy’s costume, you may take an extra wide piece of fur and roll it before stitching it to line the armholes. This gives him a more manly costume. On the off the shoulder costume, simply stitch a piece of fur around the neckline. I did it in back also. If your little one isn’t too fidgety, you can put the costume on your child and cut jagged edges at knee or just above (if they are wiggly, it may be safer to take it off first). Check that everything lays nicely and see if you have to put an extra stitch here or there. These are optional but extra fun for them. I purchased necklaces and earrings online for six dollars, and a club at a Halloween store for three dollars. For shoes, my daughter wore her furry slippers (they had been bought at Target), and I covered my sons snow boots with fur, tucked it in and put a few temporary stitches to hold it in place. I stitched a strip on the bottom to hold it on for the night. Some sandals would also look cute, but where we live its chilly on Halloween. I cut some very quick armbands out of felt and stitched on some fur. Hair…my son has very short hair so we just spiked it with some gel, and my daughter I had bend over and gathered all her hair into a ponytail on top of her head and tied a scrap of fabric around it. 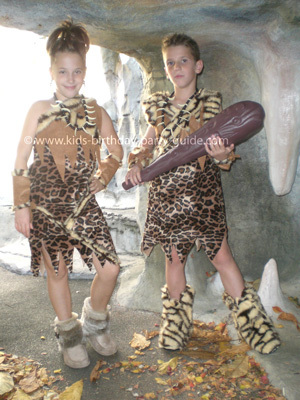 I hope you will try this caveman costume! My kids said they were warm, comfy and that these were their favorite costumes EVER. I used the extra fabric to make some super cute throw pillows!